Commercial floor systems need not withstand the same abrasive loads or harsh environments found in manufacturing facilities. 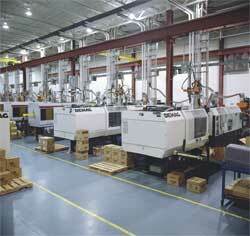 Durability, function and architectural style are more important features in commercial environments. Modern Acrylic coatings provide a beautiful floor surface with a variety of finishes, textures and colors especially suitable for retail environments. Installed MARTENS Industrial floor systems are super tough, durable and are designed to withstand acids and other chemicals found in manufacturing environments. 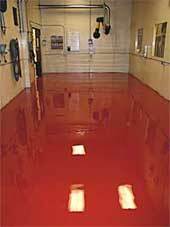 In fact, industrial floor coatings will not only protect concrete sub floors from premature deterioration, slip resistant additives can provide a safer work surface and seamless industrial floors are easy to clean and maintain. 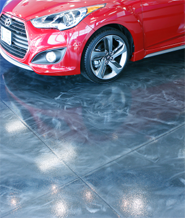 The beauty of a MARTENS installed epoxy or polymer floor is the minimum effort required to keep them clean and looking their best. It is a benefit that is most appreciated in continual use institutional environments such as hospitals, medical laboratories, health and educational facilities, where interruption of services must be kept at a minimum. For improved sanitation in hospitals, laboratories or food processing plants, antimicrobial additives can be added to thwart the spread of infectious bacterium. Walls may also be coated to provide a seamless, easy to clean room. Fire truck parking bay floor restored with a durable red epoxy finish. 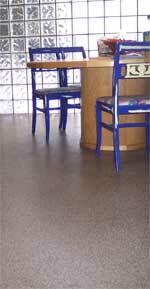 This acrylic floor features architectural appeal and a safe, non-slip textured finish. It is easy to maintain and is impervious to heavy foot traffic making it ideal for lobbies, cafeterias, dormitories and restaurants. Existing floor restoration or new floor construction, MARTENS will install a durable industrial rated epoxy floor that will withstand punishing use from heavy equipment and corrosive chemicals. When installing a MARTENS epoxy floor, you may want to consider embedding your company logo or any other color graphic in your epoxy floor. We can install any logo or color graphic. The art is embedded in the epoxy base coat and covered with a heavy duty protective clear coat. Looks great in lobbies, theme restaurants, gym or garage floors.